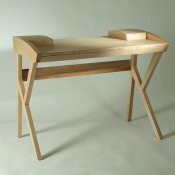 The first of two improver projects, my desk design is the ideal introduction to the added complexities of making and gluing up larger pieces. 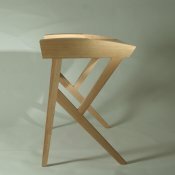 The desk features tapered sections and utilises crisp mortice and tenon and dovetailed carcass construction techniques. Students also learn to ‘shoot’ the edge of veneers to create a bookmatched design for the desk top, make crisp mortice and tenon joints with square faces on all sides that when assembled fit snugly without movement. 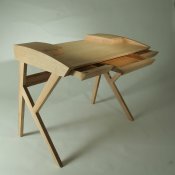 The desk is made from ash, if you wish to use another wood then please call me at least 4 weeks before your course starts (additional costs may apply). Student’s usually complete the whole project during the course, however, importance is placed on completing the top, one end section and the stretcher to a high standard, all extra material is included to complete the project at a later date. The conclusion of the improver project is the addition of two top storage boxes and two or three drawers to the previously completed desk. These use simple construction techniques but should be made crisply to fine tolerances. 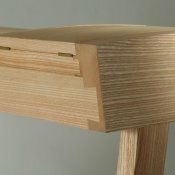 Each top box features a hinged, lipped and veneered lid, and both the drawers and top boxes use some dovetail joints.